The aorta is the main artery of the chest and abdomen that carries blood from the heart to all the body's vital organs, and eventually to the legs and feet. 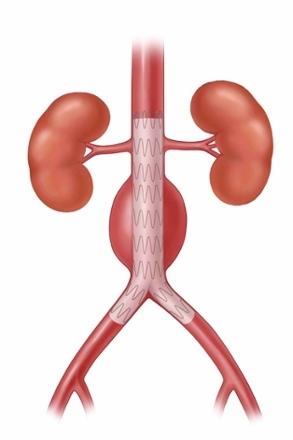 An abdominal aortic aneurysm (AAA) is a weakening in the wall of the aorta that causes a bulging or "ballooning" in the wall of the artery itself, much like a weak area of an old-fashioned rubber inner tube. An aneurysm may continue to grow larger and, if not diagnosed and treated, can rupture, often causing death. In the United States, about 15,000 people a year die from a ruptured aortic aneurysm. What are the Risk Factors for Aneurysms? Being a man older than 60 years. Your risk of developing AAA increases as you age. AAA is more common in men than in women. Having an immediate relative, such as a mother or brother, who has had AAA. If you have a family history of AAA you should have a screening test. What are the Symptoms of an Aneurysm? Most of the time there are no symptoms associated with an AAA. They are frequently found by chance during a routine physical examination, or on a CT or ultrasound ordered to evaluate another condition. Occasionally, a person may experience low back pain or abdominal pain. Symptoms associated with an AAA require urgent attention. What Tests Will be Needed to Diagnose an AAA? 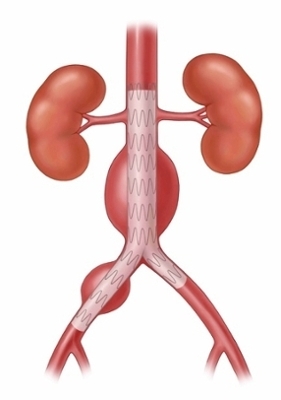 Abdominal Aortic aneurysms are most often diagnosed on ultrasound, CT scan, or MRI. An arteriogram is sometimes needed to gain more information about the aneurysm and associated blood vessels. This involves the injection of an x-ray visible dye so more detailed images of the aneurysm can be obtained. If you have a small abdominal aortic aneurysm, your vascular surgeon will recommend "watchful waiting." This means you will be monitored every 6-12 months for any changes in the size of the aneurysm. Ultrasounds are usually the imaging test of choice to evaluate the aneurysm. If you also have high blood pressure, your physician may prescribe blood pressure medication to lower the pressure on the weakened area of the aneurysm. Medications called statins are often prescribed to lower elevated cholesterol levels as well as decrease inflammation in arteries that leads to atherosclerosis. If you smoke, you need to stop now. Smoking causes inflammation in the walls of the arteries. Endovascular Stent Graft: New endovascular grafting technology allows the vascular surgeon to repair the AAA by a less invasive procedure that delivers a graft inside the blood vessels through a small incision in each groin where catheters are threaded. Endovascular repair is not possible for every AAA. Your vascular surgeon will determine which surgery is most appropriate for your situation based on the of the extent of the aneurysm, its relationship to the arteries that supply your kidneys, and any other medical conditions that may affect your surgical risk. Open Surgical Aneurysm Repair: A vascular surgeon may recommend that you have an open aneurysm repair if your aneurysm is causing symptoms, or is larger than about 2 inches (roughly 5.0 to 5.5 centimeters), or is enlarging in a short period of time. The incision is made on the abdomen or the flank. 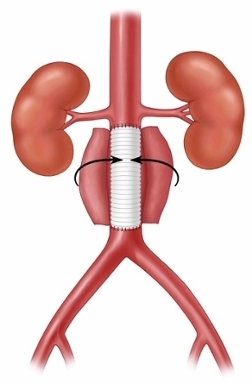 During surgery, the weakened portion of the aorta is replaced with a Dacron or Teflon graft that is carefully matched to the shape of the aorta and sewn into place. Last Modified: May 01, 2018. Contact Rebecca Bellini with questions about the content of this page.